How do today's workers learn? What drives them? Filtered and L&D benchmarking specialists Towards Maturity recently commissioned a global study of 3,500 learners to understand what motivates them to learn, their willingness to curate and share knowledge, who influences their learning choices and what support they need. 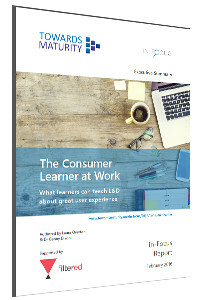 The report, 'The Consumer Learner at Work', is a wake-up call for the L&D industry.